You have your little one home from the safe and secure confines of the hospital. You were pretty happy and content with the entire staff of nurses there to keep an eye on your new bundle of joy, especially since you just gave birth. What a setup! But alas, the staff does not come home with you. I’ve been through this three times, and while the second and third times were most certainly an easier run, it’s still nerve racking. Babies are so tiny and fragile. It’s wonderful to have them home, but your mind can’t escape all that can go wrong. Sleeping with one eye open is an understatement, right? . Every coo and cough has you leaping out of bed. Well, thank goodness for technology. Of all the many choices we all have now in baby monitors, Motorola Digital Baby Monitors have been my favorite for quite some time now. They are very reliable, very sturdy, and have all the bells and whistles to keep my mind at ease. The MBP867CONNECT monitor incorporates a 2.4GHZ signal for a reliable wireless connection with easy-to-use touch buttons. You get 3 hours of continuous video streaming thanks to its battery and can watch your little peanut sleep soundly on a 7” color TFT LCD screen with 800×480 resolution. WOAH! There’s also two‐way communication which I LOVE. That means we can speak to our babies remotely. I don’t have the best singing voice, but imaging being able to soothe your baby without having to disturb them in their room. How awesome is that? This is all compatible with micro-SD cards for snap shot photo storage (hello) and playback! Awesome. Other amazing features include digital zoom, infrared night vision, and room temperature monitoring! I LOVE the last feature because one of my bedrooms gets colder than the rest — this is a great way to make sure it doesn’t get too cold while they nap. 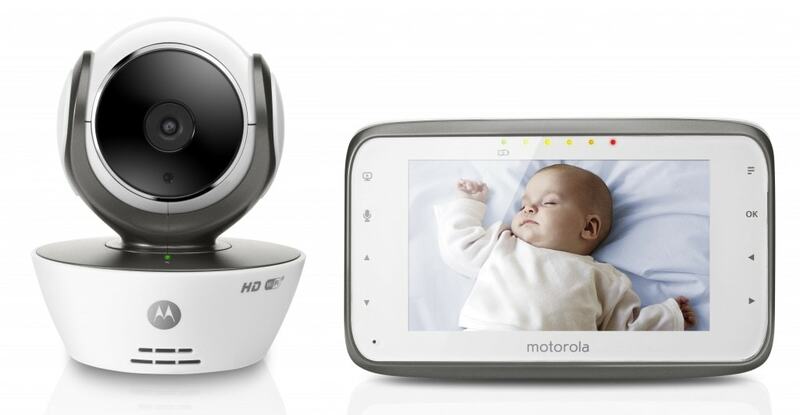 Another option is the Motorola MBP854HD Digital Video Baby Monitor with Wi‐Fi Internet Viewing. This monitor has wi-fi and wireless technology which means that you can connect while you are on the road and check in when you are away. I travel SO MUCH – this is SO IMPORTANT TO ME!!!! While at home, I can check on my little one by using the 4.3” Color TFT LCD screen with a 480×272 resolution. There’s also remote pan, tilt, and zoom — so I don’t have to sneak into the room and readjust everything and wake my boy up! Two-­way communication is also available with this model as well as a rechargeable battery, temperature alert, Infrared Night Vision, Remote HD (720P) video streaming, and H/264 video compression. PHEW! Can’t sing? Me neither! The unit offers 5 lullabies. Oh and PS – you can even view two baby units via its picture-in-­picture screen!! If you pick up one of these monitors, I know that you will feel so much more connected and in control of your sleepy little one…and you may actually get some actual sleep yourself. Trying to take care of a newborn/infant is difficult enough as it is. These monitors make it so much easier for you. Check them out and let me know what you think!! I hope it eliminates many hours and many nights of stress and exhaustion for you like it did for me. Suggested Retail of the Motorola MBP854HD Digital Video Baby Monitor with Wi‐Fi Internet Viewing is $299.99 while the MBP867CONNECT unit lists for $199.99.